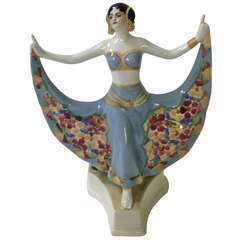 Goldscheider Vienna gorgeous dancingy lady figurine: The Captured Bird Designed by Josef Lorenzl (1892-1950) / one of the most important designers having been active for Goldscheider manufactory in period of 1920-1940 / designed1922 (=quite early!) . made circa 1930 model number 5230 / 2576 / 10 Hallmarked: Goldscheider Wien (= VIENNA) stamp mark plus following inscriptions: MADE IN AUSTRIA & HAND-DECORATED / modeller's signs visible. Subject: The Captured Bird / depicting the famous dance having been performed by Niddy Impekoven (1904 - 2002) in the Early 1920s. - The tiptoeing lady makes a large step having both arms raised: She is wearing a short dancing dress shaped like butterfly wings: The dress is excellently painted so that it is looking like butterfly wings or the lady dancer supported by vase with rose flowers is based on oval black shaded socle. Bibliography: Dechant / Goldscheider, Goldscheider (Firmengeschichte Und Werkverzeichnis / History of the Company and Catalogue of Works), Stuttgart (Germany) 2007, Pages 402/03, Number 5230 Size: Height: 46.0 cm (= 18.11 inches) Width: 40.0 cm (= 15.74 inches) - measured at spread arms Depth: 15.0 cm (= 5.90 inches) - measured at base Condition: Excellent (there aren't any damages existing). 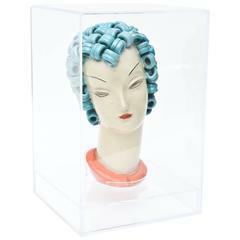 Goldscheider, Wien, partially enameled terracotta, circa 1930. A lovely and rare sculpture of a lady bird, with bird. Signed and sculpted by Mexican artist, Sergio Bustamante. In mint condition. 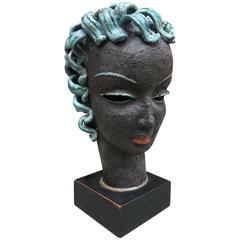 Goldscheider inspired Czech signed ceramic stylized Art Deco head.